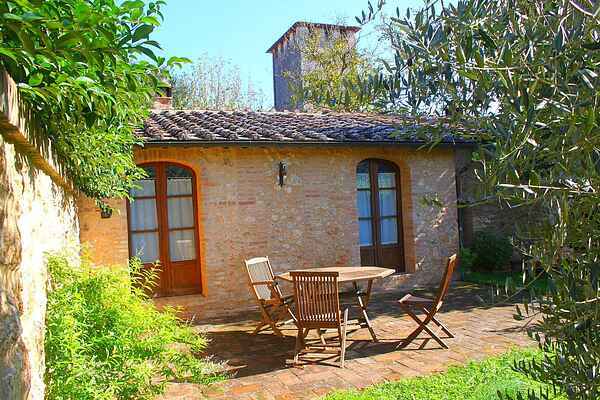 Romantic cozy single storey cottage with private garden and use of the swimming pool in the garden of a beautiful castle near Siena. The first traces and documentation relating to the property located at the foot of the Sienese Montagnola date from the year 1100aC. At that time only the tower existed with a pyramidal base and archer windows with low arches that was used for the military control of the territory in the southwest of the Republic of Siena. Different owners have restored and adjusted the castle in accordance with the conditions of the time. Additional homes were later built for the workers and at the same time increased the production of wine from the vineyards and olive oil from the olive groves to important agricultural products. Today, we are grateful for the excellent wines from the cellar and the delicious olive oil harvested and pressed on the spot. On request you can taste the biological wines of the castle with explanation about the making of it and also cooking classes There are very nice little restaurants in the neighbourhood in which you can discover the tastfull and traditional Tuscan cuisine. Go out and discover Siena and it's surroundings which are beautiful!